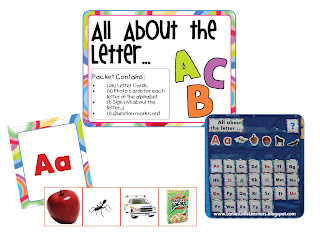 The picture is a representation of the All About the Letter Chart. The photo cards are Alphabet Soup Sorters the school district had purchased for the classroom. Instead of using the Alphabet Soup Sorter Cards you can use the photo picture cards in this activity packet. It is suggested to print all pieces on card stock and laminate for durability. Actual size for each letter card is 3.25” x 3.75” and each photo card is 2.625” x 2.6667”. Once printed cut on the solid black line for the letter cards. This way the background goes all the way to the edge. Once all pieces have been laminated and cut I used a calendar pocket chart to place all of the cards in and the photo cards are placed behind the letter.